This simple recipe comes from Romania. Neither my wife nor I are vegetarian, and have no reservations about eating meat, but we don’t eat meat on Wednesdays or Fridays. I don’t do this for any religious reasons, but it comes from the Orthodox Church in Romania, which decrees that most Wednesdays and Fridays are days of ‘post’, that is ‘fast’. On such days animal products should not be eaten (or drunk), so if followed correctly it is vegan not vegetarian. I got used to it as I lived in a region in Romania where about 70% of the population regularly attend (the Orthodox) church, so there’s no meat on the table on the days of ‘post’. I came to believe that this ‘rest’ from meat was beneficial (I’m now quite certain this is so – it fits in with my ideas that it is very beneficial to eat everything, but each in moderation) and having a set two days means you take this rest ‘religiously’ (we also eat fish on Tuesdays, for even more obscure reasons, but again it ensures we have fish once a week). Adhering to this ‘rule’ does not prevent us eating ‘veggie’, or fish, on other days if we feel like it. Heat some oil (sunflower oil in Romania but others are OK of course – just avoid those laced with chemicals as are all the fiercely promoted ‘margarines’) with some butter in a thick-bottomed pan. The Romanian one you see above is known as a ceaun (that’s cha-oon), made by Romanian gypsies. Tip the washed potatoes – don’t peel or scrape them – into the oil, stir up so that all the potatoes are coated, and add a lot of peeled garlic cloves (there are about 20 in the pot shown but these are brought back from Romania – very strong – so you might need more of those bought in the UK). Cover tightly and leave on a very low light. Stir up from time to time. 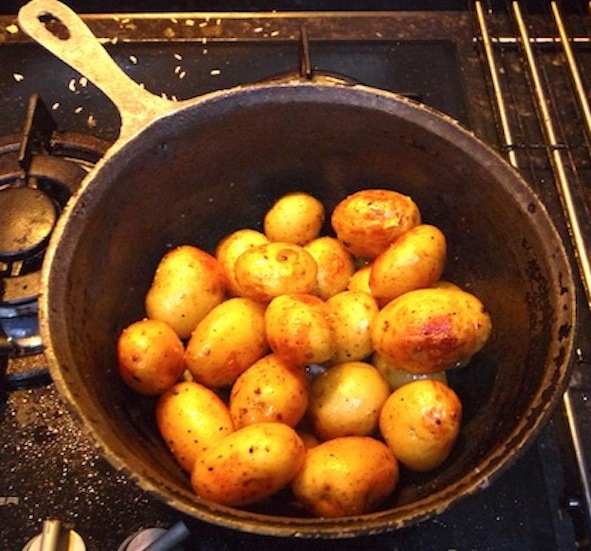 Because the potatoes are steaming in their own moisture it takes longer than you might think until they are cooked; reckon at least an hour – test by sticking a knife in; when done just keep them hot till you’ve done whatever else, they won’t spoil. Towards the end grind over some salt and black pepper and stir up. They are really delicious; make more than you need for the meal because they are great cold too. 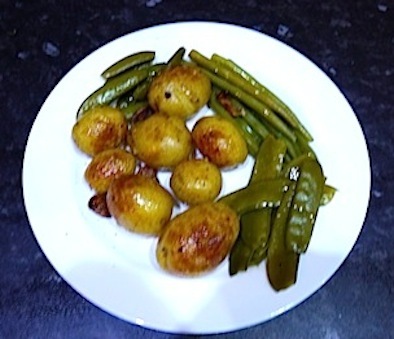 Eat them with some of your ‘five a day’; various steamed green vegetables as seen here are good (with some of the oil/butter mixture from the ceaun poured over – if you’ve been brainwashed by the cholesterol nonsense go for a run), so are sauteed mushrooms, or a mixed salad. You can, of course, make them part of any meal, with meat or fish. As I said, I am a carnivore. I really like meat and fish and have no qualms about eating anything – I’ve eaten hedgehog, dog, and very strange things from the sea. All were delicious. And, in view of the recent controversy, I’ve eaten horse – very tasty and I’d gladly eat it again. Wishing you a lovely Sunday too. I guess with the delayed darkroom you’ve got more time for cooking 🙂 . The snow has miraculously disappeared overnight here so no more ‘snow photography’. ‘Marinading’ them before in the bag sounds a great idea – I’ll try it next time. Delicious! I use to do this in summer, also with small new potatoes. I prepare them and the olive oil and garlic (finely chopped cloves) and let them lay in a plastic bag so I can turn and mix it around properly. Let them stay there for a couple of hours, then into the oven and bake them in 200C for about 45 minutes. Very nice to anything. And easy to prepare if you are having many guests. King Edwards – a great potato. I used to grow them when I had a garden. Margarine would never enter the house and I did read recently that butter and full fat milk do more good than harm, not that I needed convincing. I think there is a tradition in Eastern Europe for eating a more vegetarian diet as it is normally cheaper and can be produced on your own land; with the occasional pig thrown in for good measure and on special occasions. There is a massive, heavily financed lobby maintained by the food industry and this leads to many people eating what is essentially chemically doctored garbage. This, alongside the fact that in general we do far less physical work (not you strawbale house builders though!) than was the case, is what leads to all the health problems which is crippling the health service in the UK. And, of course, taking the cream out of milk – to sell at a better profit – means the public has to be convinced that the green, pink and even purple topped bottles of tasteless liquor is good for them.